Mega Sale! Save 22% on the ASUS DOCSIS 3.0 High Speed 16 x 4 Cable Modem, Max. Download Speed 686 Mbps, Certified for Xfinity from Comcast, Spectrum and Cox, Separate wireless router required for Wi-Fi connectivity (CM-16) by Asus at AABX. MPN: CM-16. Hurry! Limited time offer. Offer valid only while supplies last. Certified with all major ISPs, the ASUS CM-16 DOCSIS 3.0 cable modem reliably delivers download speeds of up to 680Mbps without monthly rental fees. 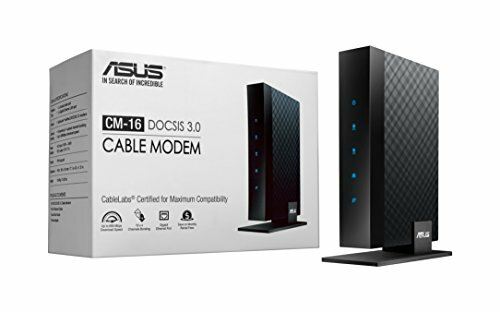 Certified with all major ISPs, the ASUS CM-16 DOCSIS 3.0 cable modem reliably delivers download speeds of up to 680Mbps without monthly rental fees. Equipped with five front-facing LED indicators to easily monitor status, the CM-16 pairs perfectly with signature ASUS routers to bring high-speed connections to your home. Lenovo Group Limited - Lenovo Thinkpad Gobi 5000 Mobile Broadband With 3Ff Sim-Verizon "Product Category: Wireless Devices/Radio Modems"